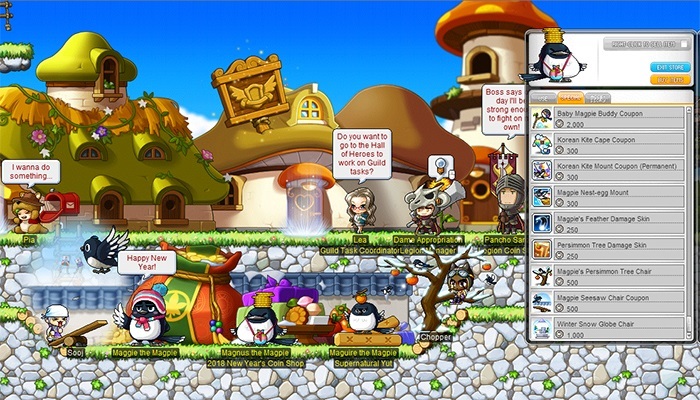 New Year Events: January 17 – February 27 | Dexless, Maplestory Guides and More! Celebrate 2018 by participating in New Year events and earning Magpie Coins to exchange for rewards! Players Lv. 33 and above can start enjoying the New Year by accepting the quest ‘[New Year's] Magpie New Years’ from the event notifier on the left side of the screen. Work on your wishes for 2018 by accepting the quest ‘[New Year's] New Year's Preparation’ from the event notifier. 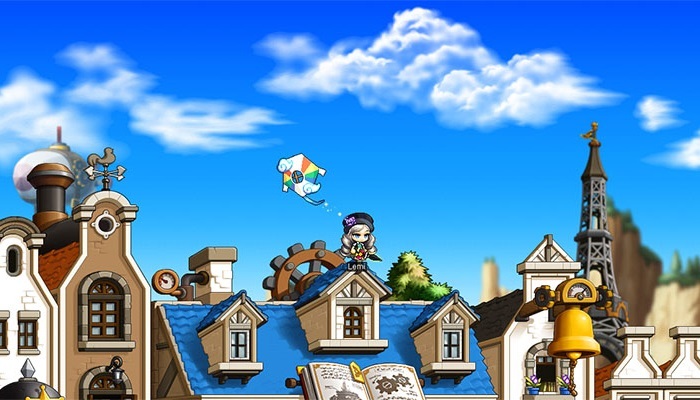 You will be given a special Wishing Kite to fly in major towns including Henesys, Ereve, El Nath, Edelstein, and Leafre. You can fly the kite once per day per world, and you can’t fly a kite in the same town more than once. Each time you fly the Wishing Kite, you’ll receive 20 Magpie Coins. When you fly the kite in the last town and complete the quest, you’ll receive an additional 50 Magpie Coins! Hunt Elite Monsters, monsters that are twice as big and have increased health and strength, during the New Year, and you may find that they drop Magpie's Gratitude Boxes! Open the box to receive 10 Magpie Coins to spend in the New Year's Coin Shop. You can receive three boxes per day per character. Join other players in some fun mini-games! 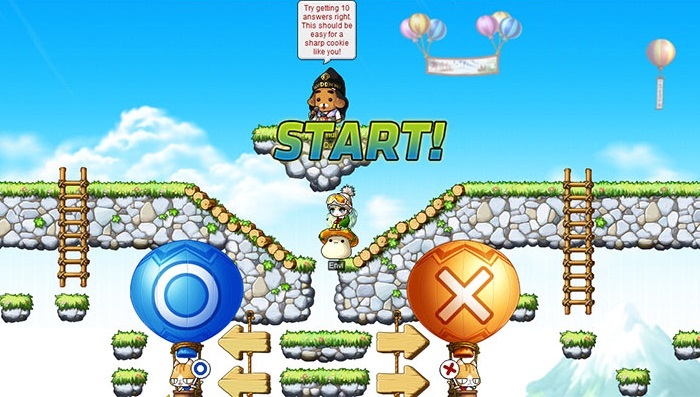 Enjoy OX Quiz, Kite Rider, and Supernatural Yut to earn Magpie Coins. An invitation for OX Quiz will appear at the 15-minute mark of every hour. Accept it to move to the event map, where you will be asked questions that you must answer correctly by moving to either the giant “O” (true) or giant “X” (false). Depending on how many questions you answer correctly, you’ll receive a varying number of coins. To play Kite Rider, accept the invitation that appears at the 45-minute mark of every hour to move to the event map. 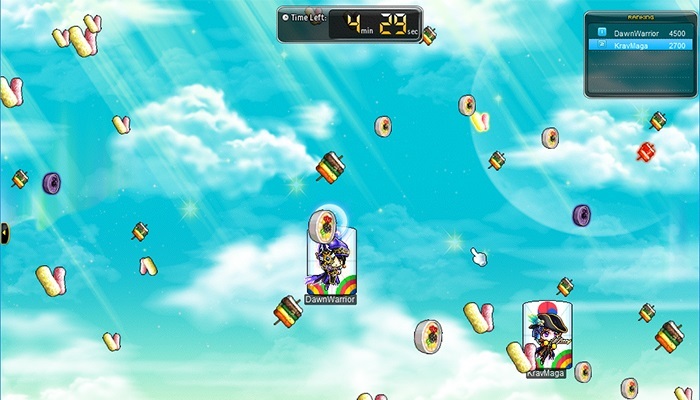 Join other players as you fly around the map and collect items dropped by Thief Crow. Depending on how much you catch, you’ll receive Magpie Coins. At the end, hunt down Thief Crow himself for an extra Magpie Coin! Speak to NPC Maguire the Magpie, located in most major towns, to move to the event map for a game of Supernatural Yut. Throw the Yut Sticks to determine how many spaces to move, as you attempt to move all four of your game pieces to the goal. 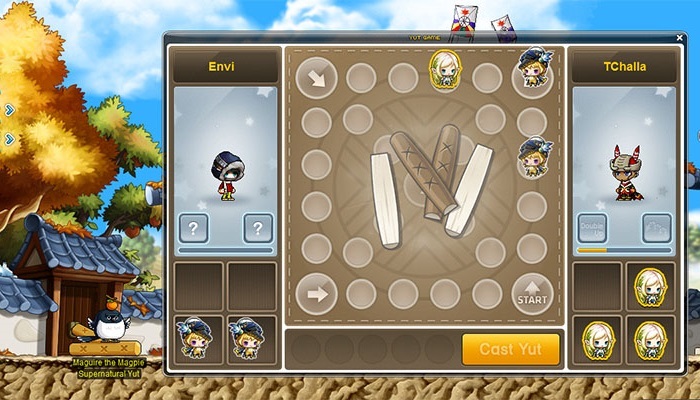 Each player also receives two supernatural powers that can affect the Yut Sticks or the game pieces. Use them before you vast your Yut Sticks for an added boost! While everyone who participates will receive Magpie Coins, Yut masters will receive the most coins. You can participate in Supernatural Yut 10 times per day per character. Complete special achievements during the New Year to earn more rewards! Click on the achievement notifier on the left side of the screen to check your progress. Achievements are shared per world, and the rewards can only be received once per world. 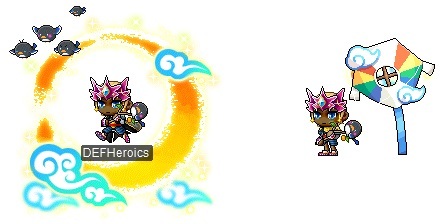 Participate in all of the New Year events, aiming for greatness! Get 30 correct answers during the OX Quiz, achieve 1st place in Kite Rider, win multiple games of Supernatural Yut, and more. Each achievement rewards you with Magpie Coins, and you can earn the Lucky title. Complete all of the achievements to receive the medal, New Year's with the Magpies. Lucky: Title. STR/DEX/INT/LUK +5, Weapon ATT/Magic ATT +5, MaxHP/MaxMP +200. New Year's with the Magpies: 20-day duration. Medal. STR/DEX/INT/LUK +30, Weapon ATT/Magic ATT +10, MaxHP/MaxMP +2000, Boss Attack +10%, DEF Ignore +10%. Collect all of your Magpie Coins and visit the New Year’s Coin Shop to exchange them for androids, damage skins, chairs, and more! Pick up exciting items including the Lucky Meister's Cube Sack, Lucky Pure Clean Slate Scroll 10% Sack, and Lucky Special Medal of Honor Sack. Each time you open a Lucky sack, you will receive anywhere from one to five items. 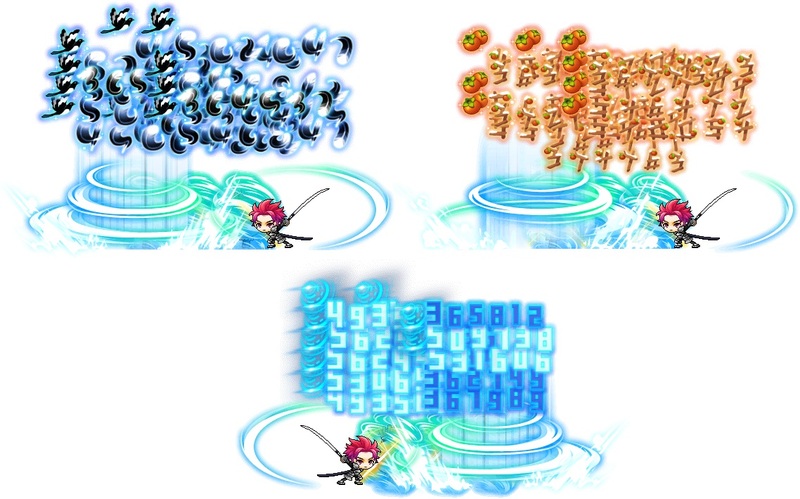 You can purchase the Lucky Meister's Cube Sack once per week, purchase the Lucky Pure Clean Slate Scroll 10% Sack twice per week, and purchase the Lucky Special Medal of Honor Sack four times per week. The Lucky Sacks refresh every week on Thursday. The shop also contains Nodestones, a Jewel Craft Ring and Magical Jewel Box, Character Slot Expansion Coupon, Baby Magpie Buddy equip, Korean Kite Cape equip, and more. 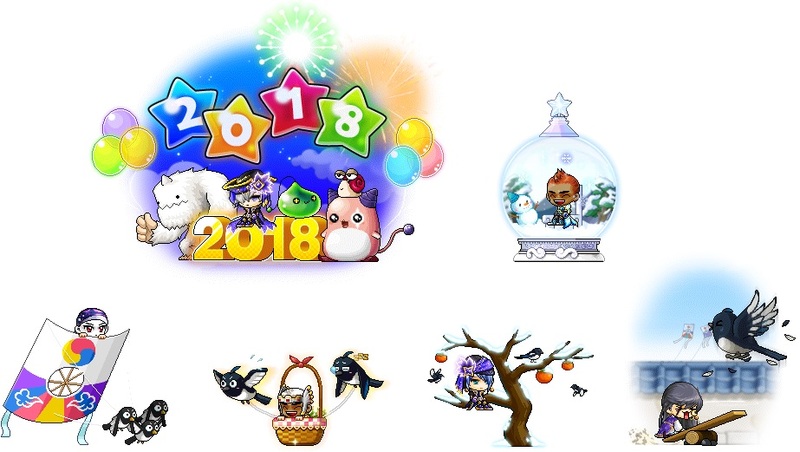 Grab some fun chairs and mounts including Happy New Year 2018! Chair, Winter Snow Globe Chair, Korean Kite Mount, Magpie Nest-egg Mount, Magpie's Persimmon Tree Chair, and Magpie Seesaw Chair. Look for androids including Orchiroid, Lotusroid, and Manjiroid. Pick up some damage skins such as Magpie's Feather Damage Skin, Persimmon Tree Damage Skin, and Returned Legend Damage Skin. You can also find coupons for Ryude’s Hat and Robe, as well as New Year's Hair and Face Coupons!